What is a road usage charge? Why is Washington state studying a road usage charge system? Will this be an additional tax? Was the road usage charge rate used in the pilot a flat rate? 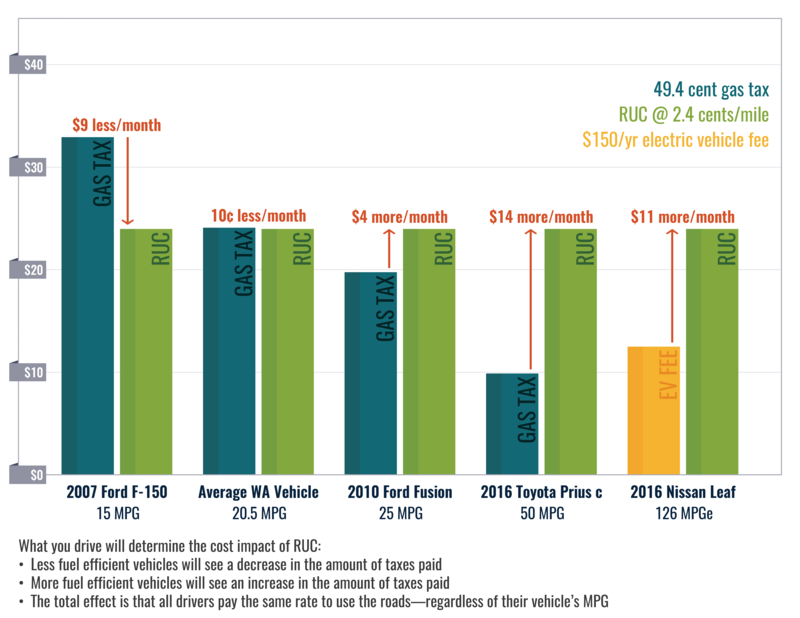 Yes, for purposes of the road usage charge pilot, we utilized a 2.4 cents per-mile mock charge across all vehicles statewide, which is equivalent to what the average car (20.5 mpg) in our state currently pays under the 49.4 cent per gallon gas tax. No real payments were made in the pilot. If the legislature decides to move forward with some form of a road usage charge, they will have the opportunity to implement additional polices to balance the impact of RUC, including establishing different per mile rates according to vehicle weight, vehicle engine type, vehicle emissions, or other criteria the legislature establishes. This kind of flexibility is not present under today’s gas tax structure. How much will a road usage charge cost me each year? Assuming the average vehicle per year travels 12,000 miles, this breaks down to 1,000 miles traveled per month. If we apply the road usage charge pilot’s rate of 2.4 cents per mile, this equates to a total of $24 per month, or $288 on an annual basis. Currently, drivers pay an average of $289.17 a year under the gas tax. What happens if I drive out of state? In the pilot, one way that drivers could ensure they were not charged for miles driven out of state was by selecting the GPS-enabled plug-in device or smartphone app options for reporting miles. These two options utilized GPS to ensure drivers were only charged for miles they drove in Washington. The State of Washington did not store or record specific location data. Only the total number of miles driven in state and on public roads was recorded. Based on the limited scoping and nature of the pilot, drivers using the “low-tech” or “no-tech” options were not able to distinguish miles driven in or out-of-state. If a road usage charge system were adopted by the state, policy makers would need to determine how to account for out-of-state mileage. Can miles be reported without using GPS data? Yes. Pilot project participants were able to pick how they recorded their miles from four options: a mileage permit, odometer readings, an automated mileage meter, or smartphone app. Each of these methods required a different method for recording and reporting data. The mileage permit and odometer reading approaches did not require any technology or GPS to utilize; however, these methods did not distinguish between miles driven inside and outside of the state. This road usage charge pilot project was a small-scale, short-term study that gave drivers in Washington the chance to experience different approaches to road usage charging. While it was a simulation of what a real system might be like, it gave drivers the chance to provide feedback and share their thoughts and experience with decision makers. The pilot project will also help decision makers better understand the pros and cons of this approach to funding our transportation system statewide. Did participants in the pilot project have to pay real money? No, participation was free—no real payments were required. However, a very small number of participants volunteered to make payments using real money as part of a narrow test with the State of Oregon to study how transactions should be made and revenue distributed. Volunteers were reimbursed for payments made. If a RUC program is put in place in the future, will the per-mile rate be adjusted based on vehicle weight? If the legislature decides to implement a road usage charge in the future, they will have to decide how to address different types of vehicles, personal trucks, small cars, and motorcycles. One of the unique aspects of a road usage charge is that, if implemented, it could allow state policymakers to set different road usage charge rates depending on different factors, such as vehicle weight, engine type or other variables. This kind of flexibility is not present under today’s gas tax structure. How would out-of-state drivers be handled in a road usage charge system in Washington state? If a road usage charge system is put in place in the future, the gas tax will likely need to stay in place while the state slowly transitions away from it. 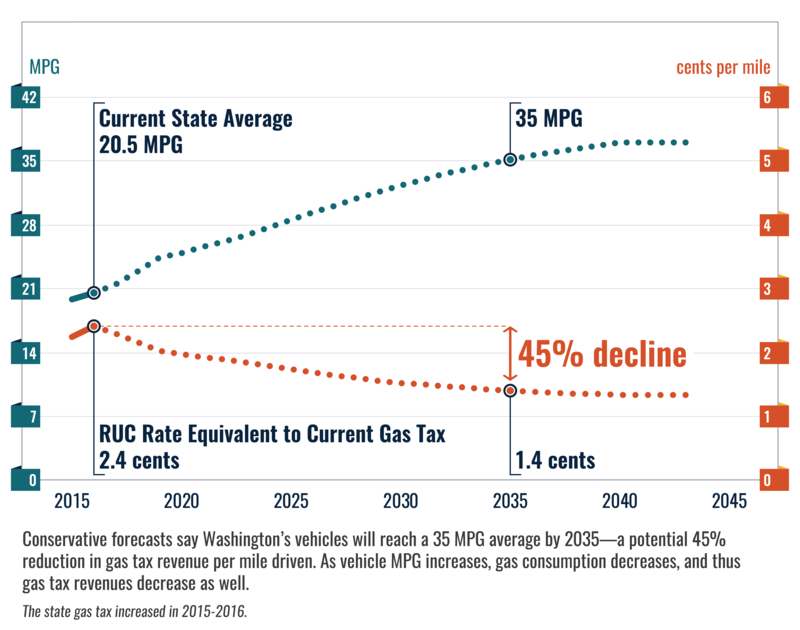 During this time, drivers would only pay the RUC or the gas tax, but not both. As long as the gas tax stays in place, out of state drivers would continue to pay the gas tax at the pump, just like they do today. Once the gas tax is fully retired, decision makers will need to determine how they will collect the tax from out of state drivers based upon the technology and systems available at that time. To help assess what approaches might work and get a sense of the challenges we may face with out of state drivers in a future with no gas tax, we recruited people from British Columbia, Idaho, and Oregon who live near the Washington border, to participate in the RUC pilot project to explore how cross-border travel would work with a Washington road usage charge system.